St. Rafael and St. Gabriel twin towers at Parque das Nações. Lisbon (Portuguese: Lisboa, IPA: [liʒˈboɐ]) is the capital and largest city of Portugal, and the westernmost capital in mainland Europe. Over the course of its existence, Lisbon has both flourished and suffered. The city's history and possibly its name as well, dates to the Phoenician Civilization. It achieved status as part of the Roman Empire, and more than 400 years under Muslim rule. Lisbon, which translates as safe harbor in ancient Phonecian, is most famous for its maritime successes during the Portuguese Age of Discovery. The city's World Heritage Site, the Monastery of the Hieronymites and the Belém Tower, were built in honor of navigator Vasco da Gama's epic voyage to India. 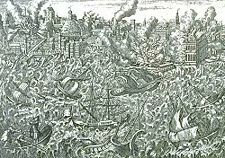 On November 1, 1755, an earthquake, followed by tsunami and fires caused the near complete destruction of Lisbon. The city rebuilt itself in visionary style. 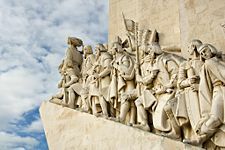 Over the next two centuries, Lisbon went through periods of foreign control, and repressive governments, and became the wealthiest region in Portugal, and the second most important financial and economic center of the Iberian Peninsula after Madrid. In the late 1930s and early 1940s Lisbon served as a point of departure for the Americas to those seeking respite from the twentieth century fascist governments of Europe. As Portugal's seat of government and residence of the President of Portugal, Lisbon is the political center of the country, as well as its cultural capital. Lisbon's name may have derived from Allis Ubbo, meaning "safe harbor" in Phoenician, or from the pre-Roman name of the River Tagus, Lisso or Lucio. Lisbon is located on the north bank of the Tagus River, the longest river on the Iberian Peninsula, about eight miles (13km) from where the river enters the Atlantic Ocean. The 25th of April Bridge spans the Tagus to the west of the city. East of that bridge, the Tagus broadens into a seven-mile (11km) wide bay called the Mar de Palha. Built up the slopes of a range of low rolling hills, the city occupies an area of 84.8 km² (33 sq mi). The western side of the city is mainly occupied by the Monsanto Forest Park, one of the largest urban parks in Europe with an area close to four square miles (10 square kilometers). Lisbon has a warm climate that is strongly influenced by the Gulf Stream, giving it one of the mildest climates in Europe. Winters are wet and windy, with the average maximum daytime temperature in January of 57.2°F (14°C). On sunny summer days, the temperature reaches an average maximum of around 82.4°F (28°C) in August. Annual rainfall is 28 inches (700 mm), spread over 100 rainy days, mostly from October to April. The oldest district of the city is Alfama, close to the Tagus, which has made it relatively unscathed through the various earthquakes. 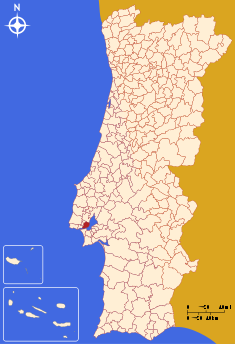 The Castle of São Jorge and the Lisbon Cathedral are located in this area. The Baixa (Downtown) or city center, which is organized in a grid system and a network of squares built after the 1755 Lisbon earthquake, was nominated for UNESCO World Heritage Site status in July 2004. The Chiado has cafes, galleries, bookshops, and eighteenth century religious architecture. The Bairro Alto (literally upper quarter in Portuguese) is a central residential, shopping and entertainment district. The Baroque-Neoclassical Estrela Basilica is the main attraction of the Estrela district. The Parliament and the Prazeres Cemetery are nearby. Along the Tagus River, is the historic neighborhood of Belém, the location of one of the city's most prominent monuments, the Jerónimos Monastery. 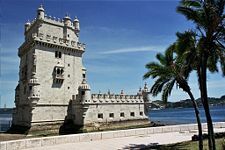 In 1983 the monastery and the nearby Torre de Belém (Belem Tower) were classified as a World Heritage Site, listed as "Monastery of the Hieronymites and Tower of Belém in Lisbon." Like most large cities, Lisbon is surrounded by numerous satellite cities. Cascais and Estoril are the most interesting neighboring towns for night life. Palaces, attractive landscapes and historical sites can be found in Sintra and Mafra. Belém Tower, a symbol of the Portuguese Age of Discovery. This 1755 copper engraving shows the ruins of Lisbon in flames and a tsunami overwhelming the ships in the harbor. Statue of King José I in the Commerce Square (Praça do Comércio), erected in 1775 as part of the rebuilding of Lisbon after the earthquake of 1755. Iberian-related peoples lived in the Lisbon region during the Neolithic period, around 4500 B.C.E. The Indo-European Celts invaded after the first millennium B.C.E. and intermarried with the Pre-Indo-European population. Phoenician remains from the eighth century B.C.E. were found beneath the Mediaeval Sé de Lisboa (Lisbon See), or main Cathedral. The magnificent harbor made it an ideal spot for a settlement to provide foodstuffs to Phoenician ships traveling to the tin islands (modern Isles of Scilly) and Cornwall. The Greeks knew Lisbon as Olissipo and "Olissipona," a name they thought was derived from Ulysses, who, according to an Ancient Greek myth, founded the city after he left Troy, and departed to the Atlantic to escape the Greek coalition. Later on, the Greek name was corrupted in vulgar Latin to Olissipona. The area was under Roman control from 205 B.C.E. to about 409 C.E. Julius Caesar (100 B.C.E.-44 B.C.E. ), made the settlement a municipium, and named it Felicitas Julia. During the time of Augustus (63 B.C.E.–14 C.E. ), the Romans built a great theater, the Cassian Baths, temples, a large necropolis, a large forum, and multi-storied apartment buildings in the area between the modern Castle hill and Downtown. Economically, Olissipo was known for its garum, a highly prized fish sauce exported in Amphorae to Rome and other cities. Wine, salt and its famously fast horses were also exported. Trade boomed with the Roman provinces of Britannia and the Rhine, and with tribes living up the river Tagus. A broad road connected Olissipo to Western Hispania's two other large cities, Bracara Augusta (today's Portuguese Braga), and Emerita Augusta, the capital of Lusitania (now Mérida in Spain). Olissipo was a center for the dissemination of Christianity. Its first attested Bishop was St. Potamius (c. 356), and martyrs during Emperor Diocletian's persecutionss (303–311) included Maxima, Verissimus, and Julia. Sarmatian Alans and the Germanic Vandals, invaded Olissipo and controlled the region from 409 to 429. The Germanic Suebi, who established a kingdom in Gallaecia (modern Galicia and northern Portugal) from 409 to 585, also controlled Lisbon for long periods of time. In 585 the Suebi kingdom was included in the Germanic Visigothic kingdom of Toledo, that comprised all of the Iberian Peninsula. Lisbon was then called Ulishbona. The Muslims of North Africa (Moors) took Lisbon around 711 when they overran the Iberian Peninsula. The Moors, who stayed for 433 years, called the city al-ʾIšbūnah and built numerous mosques, houses, and a new city wall, named the Cerca Moura. Arabic was the official language. Islam was the official religion, although Christians could keep their religion but were required to pay the jizyah tax. In 1147, as part of the Reconquista, a period of 800 years during which Christian kingdoms succeeded in retaking the Iberian Peninsula from the Muslims, crusader knights led by Afonso I of Portugal (1109–1185), besieged and reconquered Lisbon. Arabic lost its place in everyday life, and any remaining Muslim population were gradually converted to Roman Catholicism, or expelled, and the mosques were turned into churches. Lisbon then had a population of 154,000. Lisbon became the de facto capital city of Portugal in 1255 due to its central location. The first Portuguese university was founded in Lisbon in 1290 by Dinis I of Portugal (1279–1325). During the last centuries of the Middle Ages, the city expanded substantially and became an important trading post with both northern Europe and Mediterranean cities. Vasco da Gama (1460 or 1469–1524) led a Portuguese fleet of four ships to India from Lisbon in 1498, one of numerous Portuguese expeditions of the Age of Discovery departing from Lisbon during the 15th to 17th centuries. The city became the European hub of commerce with Africa, India, the Far East and, later, Brazil, exploiting riches such as spices, slaves, sugar, textiles and other goods. The first Portuguese census in 1527 counted 65,000 inhabitants in Lisbon, a considerable number of whom became rich. Under the rule of King Manuel I (1495–1521) Portugal developed Manueline architecture, that celebrated the voyages of discovery, Manuel, and God. The city was endowed with larger and more luxurious buildings. The Belém Tower and the Jerónimos Monastery were built during this period. The Great Lisbon Earthquake struck on November 1, 1755, at around 9:40 in the morning. The earthquake was followed by a tsunami and fires, which caused near-total destruction of Lisbon and adjoining areas. Geologists estimated the earthquake approached magnitude 9 on the Richter scale. Estimates place the death toll in Lisbon, after the earthquake, tsunami, and fires that blazed for days, at around 60,000 people. More than 12,000 buildings were destroyed, making it one of the most destructive earthquakes in history. The city was rebuilt according to the plans of Prime Minister Sebastião José de Carvalho e Melo, the 1st Marquess of Pombal (1699–1782); hence the designation of the lower town as Baixa Pombalina (Pombaline Downtown). Pombal demolished the earthquake ruins and rebuilt the downtown following modern urban rules. Lisbon alternated between French and British control during the Peninsular War, a contest between France and the allied powers of Spain, the United Kingdom, and Portugal for control of the Iberian Peninsula during the early 1800s. Troops of Napoléon Bonaparte (1769–1821) invaded Portugal in 1807, sending Prince-Regent João and his family in flight to Rio de Janeiro in Brazil. Rio replaced Lisbon as the capital of the Portuguese empire from 1808 to 1821. Ten years of revolutionary outbursts in Lisbon followed as liberal constitutionalists and absolutists fought over succession to the throne. In 1879, a new main street, the Avenida da Liberdade was opened. The six-lane carriageway had wide blue mosaic sidewalks with palms, fountains, ponds stocked with goldfish and swans, and outdoor cafés beneath the trees. By 1885, Lisbon covered 20,378 acres (8,250 hectares), and had a population of 300,000. Lisbon was the stage of the assassination of Carlos I of Portugal, on February 1, 1908, and was the center of a coup on October 5, 1910, which installed the Portuguese Republic. António de Oliveira Salazar (1889-1970) took control of the near-bankrupt country in 1932, and established an authoritarian corporate state until his retirement in 1968. During World War II Lisbon was one of the very few neutral, open European Atlantic ports, a major gateway for refugees to the U.S., and a spy nest. In 1974, Lisbon was the central destination point of the Carnation Revolution a left-leaning military coup that began on April 25, 1974. In 1988, a fire near the historical center of Chiado greatly disrupted normal life in the area for about 10 years. In 1994, Lisbon was declared the European Capital of Culture. 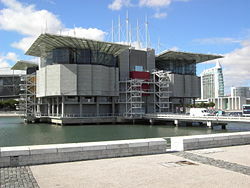 The 1998 World’s Fair, held in Lisbon, sparked a waterfront renovation, giving Lisbon a new look. The expo was timed to commemorate the 500th anniversary of Vasco da Gama's sea voyage to India. In March 2000, the Lisbon Agenda, an agreement on measures to revitalize the European Union economy, was signed in Lisbon. Portugal is a parliamentary representative democratic republic, in which the president, who is chief of state and is directly elected to a five-year term, appoints the prime minister, who is head of government, and council of ministers, according to assembly election results. There is also a council of state, which is a presidential advisory body composed of six senior civilian officers. The unicameral assembly of the republic (Assembleia da Republica) has 230 members who are elected by popular vote to serve four-year terms. Portugal consists of 308 municipalities (Portuguese singular/plural: Concelho/concelhos), which are subdivided into more than 4000 parishes (freguesia/freguesias). Municipalities in continental Portugal are gathered in 18 Districts. Lisbon is the seat of the district of Lisbon and capital of the Lisbon region. There are 53 freguesias (civil parishes) in Lisbon. Lisbon is divided into historical "bairros" with no clearly defined boundaries, such as Amoreiras, Bairro Alto, Bica, Alfama, Mouraria, Avenidas Novas, Intendente, Chelas, and Lapa. Portugal has become a diversified and increasingly service-based economy since joining the European Community in 1986. Over the two decades to 2009, successive governments have privatized many state-controlled firms and liberalized key areas of the economy, including the financial and telecommunications sectors. Gross domestic product per capita, estimated at $22,000 in 2008, stands at roughly two-thirds of the European Union average. A poor educational system, in particular, has been an obstacle to greater productivity and growth. The Lisbon region is the wealthiest region in Portugal, is the second most important financial and economic center of the Iberian Peninsula, and it is well above the European Union's GDP per capita average – it produces 45 percent of the Portuguese GDP. Lisbon's economy is based primarily on the service sector, which employs 75 percent of the labor force. Most of the headquarters of multinational companies operating in Portugal are concentrated in the Grande Lisboa subregion, specially in the Oeiras municipality. A temperate climate, beaches, castles, and historic districts attract tourists every year. Tourism revenues have helped offset negative national trade balances. 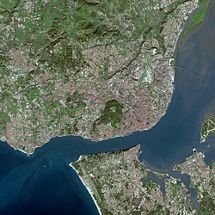 Lisbon Metropolitan Area is heavily industrialized, especially the south bank of the Tagus river (Rio Tejo). Rail and road links connect Lisbon to the rest of Portugal and elsewhere in Europe. There are four commuter train lines departing from Lisbon. The main railway stations are Santa Apolónia, Rossio, Gare do Oriente, and Cais do Sodré. Lisbon is connected to its suburbs and the rest of Portugal by an extensive motorway network. There are three circular motorways around the city; the 2ª Circular, the CRIL and the CREL. 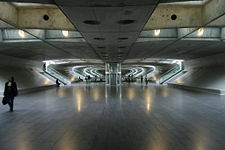 The Lisbon Metro is the city's main public transport artery, connecting the city center with the upper and eastern districts, and now reaching the suburbs. Ambitious expansion projects will increase the network by almost one third, connecting the airport, and the northern and western districts. A traditional form of public transport in Lisbon is the tram. Other than on the modern Line 15, the Lisbon tramway system still uses small (four wheel), yellow, 1930s vehicles well suited to the steep hills and narrow streets of the central city. The city's three funiculars, or inclined cable railways, are great tourist attractions. Two bridges cross the Tagus River, including the 1.5 mile (2.4km) 25th of April Bridge, one of the longest suspension bridges in western Europe, and the Vasco Da Gama Bridge, inaugurated on May 1998 is, at 10.7 miles (17.2km), the longest bridge in Europe, as well as a ferry service. The Port of Lisbon is a large European Port highly ranked for the handling of containerized cargo and solid bulk agricultural foodstuffs. Alcântara has a container terminal and dock for cruise ships. The Portela Airport is located within the city limits. TAP and Portugalia have their hubs here and the flights available are mostly to Europe, Africa and America. Panoramic view of Lisbon from the top of Cristo-Rei, with 25 April Bridge. View of Vasco da Gama Bridge from atop Vasco da Gama Tower. Finished in 1998, is the longest bridge in Europe. A building of the New University of Lisbon. Lisbon city had a population of 564,477 in 2004 in 84.8 km² (33 sq mi), the Lisbon Metropolitan Area had around 2.64 million inhabitants, and 3.34 million people lived in the Lisbon Metropolitan Region, which includes the cities of Leiria and Setúbal). Native Portuguese are ethnically a combination of pre-Roman Celts with contributions from Romans, Germanic (Visigoths, Suebi), Jews, and Moors. Citizens of black African descent who immigrated to the mainland during decolonization number fewer than 100,000. Since 1990 Eastern Europeans have entered Portugal. Portuguese is the main official language. Portugal has no state religion. About 84 percent of the population belonged to the Roman Catholic Church in 2001, although only about 19 percent attended Mass. Other Christians make up 2.2 percent, other 0.3 percent, unknown 9 percent, none 3.9 percent. There are three major public universities in Lisbon: the University of Lisbon, founded in 1911, the Technical University of Lisbon, founded in 1930, and the New University of Lisbon, founded in 1973). There is also one state-run university institute, the ISCTE, and a polytechnic institute, the Polytechnical Institute of Lisbon. 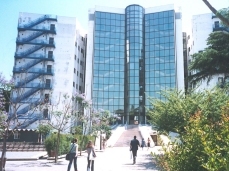 Private universities include the Portuguese Catholic University, the Lusíada University, the Universidade Lusófona, and the Universidade Autónoma de Lisboa, among others. View from São Jorge Castle. Lisbon is the location of a World Heritage Site which includes two of Lisbon's most famous structures, the Monastery of the Hieronymites and the Belém Tower. The Monastery of the Hieronymites is considered one of the most successful achievements of the Manueline style. It was built, starting in 1502, on the site of a hermitage that was founded by Henry the Navigator at about 1450. The other heritage structure, the Belém Tower, was constructed between 1515 and 1521, also in the the Manueline style, to commemorate Vasco da Gama's expedition. The defensive, yet elegant construction has become one of the symbols of the city, a memorial to the Portuguese power during the Age of the Great Discoveries. 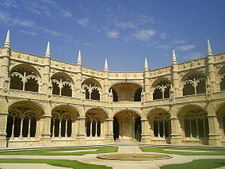 The joint site is listed by UNESCO as the Monastery of the Hieronymites and Tower of Belém in Lisbon. Romanesque, Gothic, Manueline, Baroque, Traditional Portuguese, Modern and Post-Modern constructions can be found all over the city. 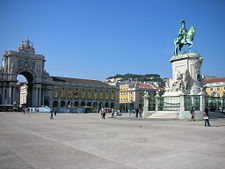 The city is also crossed by great boulevards, including the Avenida da Liberdade, and Avenida da República. Museums include the National Museum of Ancient Art, the Museum of Portuguese-style Tile Mosaics, the Calouste Gulbenkian Museum, containing varied collections of ancient and modern art, the Lisbon Oceanarium, the National Museum of Costume and Fashion, the Berardo Collection Museum (modern art), and the National Coach Museum, containing the largest collection of royal coaches in the world). Theaters include the Teatro Nacional de São Carlos, the Centro Cultural de Belém, the Teatro Nacional D. Maria II and the Gulbenkian Foundation. A monument to Christ the King stands on the left side of the river. The municipal holiday is June 13, St. Anthony's Day. There are five days of street celebrations in memory of Lisbon-born saint Anthony, a wealthy Portuguese bohemian who was canonized following a life preaching to the poor. Lisbon hosts the annual Lisbon Gay & Lesbian Film Festival, the Lisbon International Documentary Film Festival, the Contemporary Art Fair, the International Organ Festival of Lisbon, the Lisbon Village Festival, the Street Magic World Festival, among others. 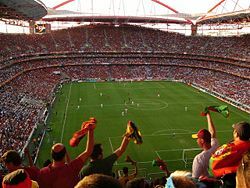 Football is the most popular sport in Lisbon. Major football clubs include S.L. Benfica, with its home 65,000 seat stadium the UEFA 5-Star Stadium Estádio da Luz . Sporting Clube de Portugal is the other major football team from the city, also having a UEFA 5-Star stadium, 52,000 seat Estádio José de Alvalade stadium. Belenenses is the third most important football team in the city, having Estádio do Restelo as its home stadium in the Belém neighbourhood of Lisbon. Other sports, such as indoor football, handball, basketball and roller hockey are also popular. Every March the city hosts the Lisbon Half Marathon, which attracts 30,000 participants and thousands of spectators. More than one-fourth of Portugal's inhabitants reside in the Lisbon metropolitan area, which occupies only about three percent of the nation's total area. A population surge during the 1970s included the return of Portuguese citizens who had been living in its African colonies. By the mid-1990s, Africans, mainly from Cape Verde, were the most populous immigrant group in Lisbon. Today the foreign population, including immigrants from Brazil, Angola, Guinea-Bissau, and various European countries, accounts for about one-tenth of the city's residents. While this large influx of immigrants has put a strain on the city’s resources, it has also transformed it into a cosmopolitan metropolis. The city has a higher percentage of doctors and other health professionals than the rest of Portugal, and its educational system is strong. 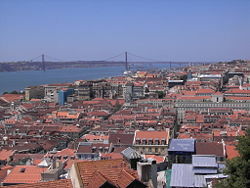 Lisbon began to undergo modernization following Portugal's 1986 entry into the European Community. 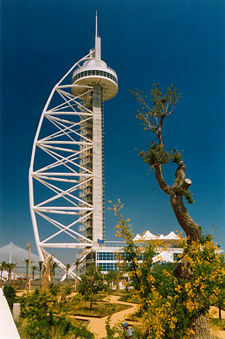 The 1998 World’s Fair spurred further modernization of the infrastructure, stimulated economic growth, and increased tourism. While Portugal's economy fell behind other European nations in the early twenty-first century, Lisbon's economy remained more stable than that of other of the nation's cities. It continues to attract both tourists and foreign and real estate investment. ↑ UNESCO World Heritage Centre, Tentative Lists - Pombaline 'Baixa' or Downtown of Lisbon. Retrieved February 16, 2009. ↑ UNESCO World Heritage Centre, Monastery of the Hieronymites and Tower of Belém in Lisbon. Retrieved February 16, 2009. ↑ André Belo, Between History and Periodicity: Printed and Hand-Written News in 18th-Century Portugal, Brown University. Retrieved February 10, 2009. ↑ Alvaro S. Pereira, March 2006, The Opportunity of a Disaster: The Economic Impact of the 1755 Lisbon Earthquake, University of York, Department of Economics. Retrieved February 10, 2009. ↑ CIA World Factbook, 2009, Portugal. Retrieved February 6, 2009. ↑ Organisation for Economic Co-operation and Development, and NetLibrary, Inc, 2006, Competitive Cities in the Global Economy. Retrieved February 10, 2009. ↑ Statistics Portugal, Statistical Information. Retrieved February 10, 2009. ↑ Fernando Nunes da Silva, 2007, Classificação Expresso das melhores cidades portuguesas para viverem 2007. Retrieved February 10, 2009. ↑ Running Portugal, Lisbon Half Marathon. Retrieved February 16, 2009. CIA World Factbook. 2009. Portugal. Retrieved February 6, 2009. Ferreira, Emília, and Jorge Cabello. 2004. Art and History Lisbon. Florence, Italy: Bonechi. ISBN 788880293941. Jack, Malcolm. 2007. Lisbon, City of the Sea: A History. London: I.B. Tauris. ISBN 9781845114039. Lisbon. 2007. Wallpaper city guide. London: Phaidon. ISBN 9780714847245. Maxwell, Kenneth. 1995. The Making of Portuguese Democracy. Cambridge, MA: Cambridge University Press. ISBN 9780521460774. Pinto, António Costa. 1998. Modern Portugal. Palo Alto, CA: Society for the Promotion of Science and Scholarship. ISBN 9780930664176. Wheeler, Douglas L. 1993. Historical Dictionary of Portugal. (European historical dictionaries, no. 1.) Metuchen, NJ: Scarecrow Press. ISBN 9780810826960. Portal das Nações Official site of Parque das Nações in Lisbon. This page was last modified on 23 July 2018, at 21:09.